Today only a few of the oldest Jewish women from Kerala, South India, can personally remember the traditional women's circle dance that highlighted the Hanukah parties of their youth. 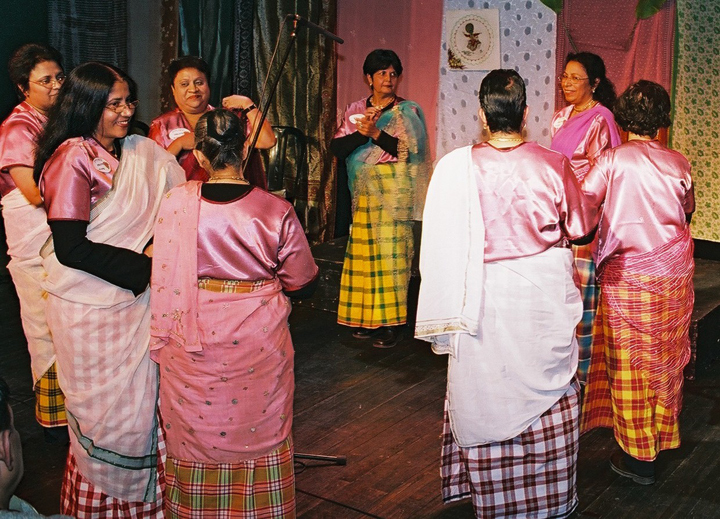 It was performed by their mothers, aunties, grandmothers, and neighbors, moving around a circle in a coordinated pattern of hand clapping, foot stamping, and turns, while singing traditional Jewish songs in the Malayalam language of the land. Every night during Ḥanukkah . . . people would join together and have a party in one house or another in the Town, a different house every night. People shared the expenses and made some snacks—such as a small roasted fish stuffed with onions and chilies—and toddy [alcohol from fermented coconut palm sap] and other things too. This was the time the ladies would sing and dance around in a circle clapping hands and keeping time with their feet. Most women who remember these parties were teenagers or young women when they migrated to Israel, in the group aliyah of most Kerala Jews during the early 1950s. The Hanukah dances were not continued after that time—not in India, where only a few dancers remained, nor in Israel, where the Malayalam language and songs of the past were gradually set aside by immigrants and their descendants (more than 5,000 now identify as "Kochinim" in Israel). A woman's song notebook from Ruby Daniel's family, written mid 19th century. Photo by Barbara C. Johnson. But fortunately the old songs were not completely lost in the pressures of adjusting to a new life. Beginning in the late 1970s, more than 300 Malayalam Jewish women's songs were salvaged through cooperation between older Kochini women and outside scholars. When the late Israeli anthropologist Shirley Isenberg (1918–2000) and I first began to make audio recordings and collect handwritten song notebooks from Kerala Jewish women in India and in Israel, we were told about the Hanukah parties and circle dances that used to be associated with just one of the eight synagogue-based Jewish communities in and near the city of Kochi. This was the Kadavumbhāgam community in Kochi, whose colorful synagogue interior would be transported from India, restored, and reconstructed inside the Israel Museum in Jerusalem in 1995. Alongside the physical structure of their synagogue, their traditional circle dance, called ninnukaḷi (standing play) was also preserved for posterity, in the form of a 1981 video recording. After aliyah, many immigrants from Kadavumbhāgam-Kochi settled in Moshav Taoz near Jerusalem, where Isenberg became acquainted with older women who remembered the dance. As a result, a special Hanukah party was arranged for Avigdor Herzog from the Jewish Music Research Center (JMRC) at Hebrew University to film the dance. His video recording from that party, on December 23, 1981, in Taoz, is the only existing record of a complete Kerala Jewish circle dance. Digitized in the National Sound Archives of the JMRC, it is a rich resource for analysis of the dance form. The Taoz performance included the singing of ten songs with accompanying dances, which display considerable variety in themes, melodies, rhythm, and tempo. As in most traditional Indian dance performances, the opening number is an invocation—in this case a poetic rendering in Jewish Malayalam of "Yigdal ’Elohim Ḥai," the well-known fourteenth-century Hebrew piyyut, which appears in the extensive Kochini repertoire of Hebrew songs (which are sung together by women and men). It is followed by another devotional song, uniquely Indian with its reference to a woman so caught up in "worldly delusions" that she gets lost in the mundane task of counting chili peppers rather than counting her spiritual treasures. Then comes the popular "Parrot Song" conveying an allegory of community origin in Kerala, then three lively wedding songs, and four biblical narratives. At first glance, the dance steps and clapping may appear simple, but the dancers move skillfully in transitions between four different patterns of clapping, foot movements, and gestures. A straightforward clapped beat with steps toward and away from the seated singers punctuates the graceful melody of a marriage song, capturing the rhythm of a bridegroom bending "this way and that way" as he walks through the Jewish street in his wedding procession. 'The Noble Bridegroom' - 1981 Taoz performance. Lead dancer Miriam Daniel (foreground, back to camera) begins the movement and clapping. Gracefully moving this way and that way. Jewish Music Research Centre, Hebrew University of Jerusalem. Performance of a song about how Aaron helped Moses to receive the Torah combines a simpler and more repetitious tune with a more complex pattern of clapping and gestures. ''When Moshe Received Knowledge' - 1981 Taoz performance. Excerpt begins with lead singer Rachel Nehemiah searching for correct page in her family notebook. A third rhythmic pattern involves combining hand claps and foot stamps with a growing escalation of tempo, accompanying "Golden Palanquin,” a riddle song about a bride and her mother. 'Golden Palanquin' - 1981 Taoz performance. Watch for the footwork and tempo escalation. 'What about the shapely maiden? What gift shall I give to her? This 1981 video can be viewed in terms of its two cultural contexts—Indian and Israeli. 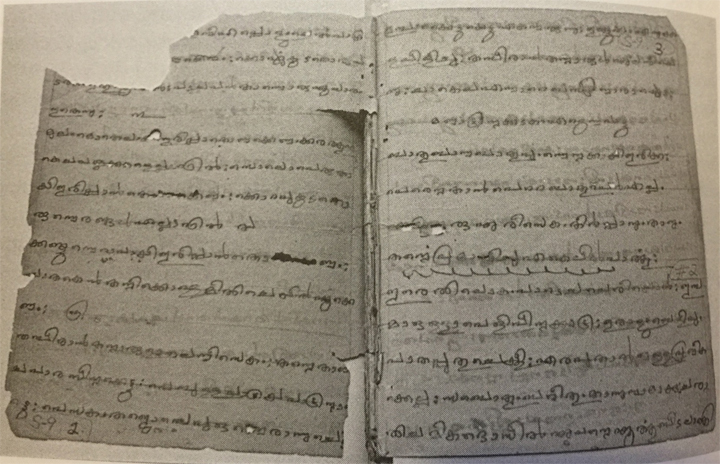 Ancestors of today's Israeli Kochinim lived for well over a thousand years in peace and security on the lush green Kerala coast of southwest India. They were loyal and observant Jews who also identified proudly with the wider culture of Kerala, enjoying good relationships with Hindu, Muslim, and Christian neighbors. Their Hanukah dance was a Jewish version of the women's circle dance genre known in the Malayalam language as kaikoṭṭikaḷi (hand-clapping play), traditionally and currently performed throughout the area by members of all four religious traditions: Margamkaḷi by Christians, Oppaṇa by Muslims, and Tiruvātirakaḷi by Hindus. The association of the Jewish circle dance with Hanukah may be related to the shared centrality of lighted lamps. In the Hindu and Christian circle dances, women move in a circle around a tall ritual lamp lit with coconut oil. The Jewish ninnukaḷi began only after the brass Hanukah lamps had been lit and placed near the window of each Jewish home, and the honored place in the center of the ninnukaḷi circle was held by older women experts leading the songs. In addition to providing valuable information about the dance itself, the 1981 video shows the Taoz community's effort to place the ninnukaḷi in its traditional Indian context—a community party for women, men, and children featuring typical Kerala snacks and the ritual lighting of Hanukah candles (replacing the coconut oil lamps of Kerala). We see that some women have set aside their everyday Israeli clothing and dressed up in saris for the occasion, adding long-sleeved sweaters to ward off the December chill in the hills west of Jerusalem, far from the warmth of tropical Kerala. Though the video stops before the end of the dancing, the audio captures its conclusion—the loud, joyous sound of kurava, the celebratory ritual ululation performed by women on festive occasions throughout South Asia, North Africa, and the Middle East. Nirit Singers, after a dress rehearsal in Ramat Eliyahu, 2006. Photo by Barbara C. Johnson. Now let me jump ahead to an unexpected twenty-first-century development—a performance revival of Malayalam Jewish songs by a group of older Kochini women in Israel, for whom the 1981 video provided some inspiration. Eight of the ten dance songs recorded that evening in Taoz were among the thirty-two excerpted in a 2004 CD produced by the JMRC: Oh! Lovely Parrot: Jewish Women's Songs from Kerala. The process of producing this CD also involved studio re-recordings by five Kochini women. From their initial meeting emerged a performing group calling themselves the Nirit Singers. During the next few years they gave a variety of public performances—not only for Kochini gatherings but also at Hebrew University for the launching of the CD; at a municipal auditorium in Rishon LeZion; for a scholarly audience at the Van Leer Institute in Jerusalem; and for an Indian Independence Day celebration at the Tel Aviv home of the Indian ambassador. A standard feature of their repertoire was the song "Oh! Lovely Parrot," performed as a ninnukaḷi. Venus (Tzipporah) Lane recalled for me how they all learned to do the dance, which most of them had never seen. She went with her friend Simḥa Yosef to the apartment of a relative to watch a family copy of the 1981 Herzog video, in which Simḥa's mother Rachel Nehemiah had been the lead singer. Carefully studying the dancers' steps and gestures, they then taught them to the other Nirit Singers. 'Parrot Song,' excerpt from ninnukaḷi in Nirit Singers' performance, Van Leer Institute, Jerusalem, 2006. Recording by Barbara C. Johnson. In contrast to the 1981 video, Nirit Singers' performances were detached from the Hanukah context. Some were held on an elevated stage, with singers facing a physically separate audience including non-Kochini strangers. They wore colorful matching costumes made for the occasion, patterned after an old-fashioned style of Kerala women's dress. Their entrances, exits, and transitions were carefully choreographed and rehearsed. The brief ninnukaḷi number was adjusted to fit the spatial constraints of the stage, with two lead singers standing to the side and the dancers circling around one seated member of the chorus. "Parrot Song", ninnukaḷi in Nirit Singers' performance, Rishon LeTzion 2005. Photo courtesy of Galia Hacco. Much had changed in Israel during the twenty-five years between these two dance performances. In 1981, though no longer living on one Jewish street in India, where the ninnukaḷi had been an integral part of the surrounding Kerala culture, the older women of the immigrant generation were still grounded in that culture. They lived in an Israeli community of families originating from the Kadavumbhāgam-Kochi community. They spoke Hebrew with other Israelis, including the researchers, but still spoke Malayalam with each other. Although they initiated this event in response to a request from outside, it was also for their own enjoyment, as an approximate recreation of a well-remembered Kerala Hanukah party. In contrast, members of the Nirit Singers grew up in families from five different Kerala Jewish communities, and by the early twenty-first century they lived in widely scattered Israeli towns and cities. 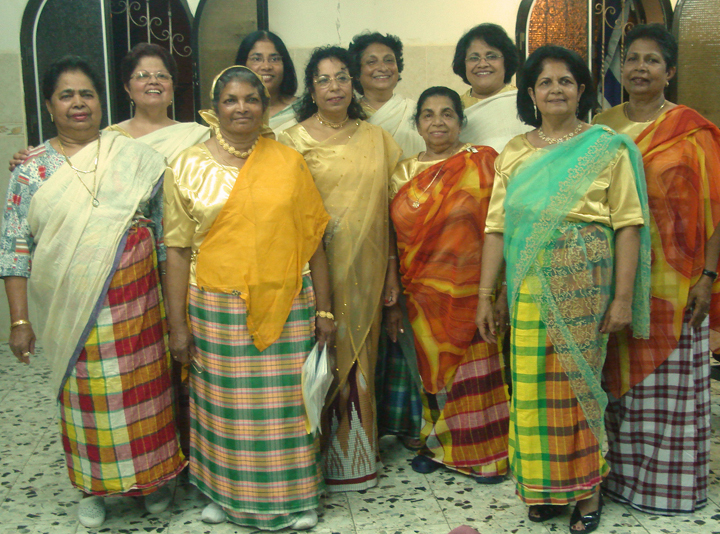 As articulated by retired social worker Galia Hacco, organizer and leader of the group, their commitment to a rigorous schedule of group meetings, rehearsals, and performances reflected a desire to preserve and pass on something of their Kerala culture for future generations of Israeli Kochinim, as well as proudly share that culture with other Israelis. When they produced a CD of their own, it was accompanied by a booklet with the Malayalam song texts transliterated into Hebrew script for that new audience. And thanks to the 1981 Taoz recording, they were also able to include in their performances a small sound-glimpse of the ninnukaḷi, which may never again be performed in its entirety. Barbara C. Johnson is professor emerita of Anthropology at Ithaca College. She is coauthor of Ruby of Cochin: A Jewish Woman Remembers (Jewish Publication Society, 1995) and editor of the CD/booklet Oh, Lovely Parrot! Jewish Women's Songs from Kerala (2004) and a forthcoming companion book of seventy-nine Malayalam Jewish songs with English translations, notes, and musical transcriptions (Jewish Music Research Centre, Hebrew University, Jerusalem).